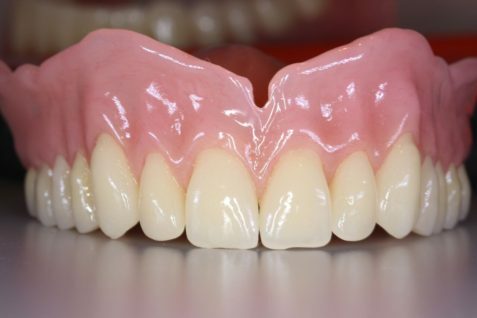 An immediate denture is a complete denture or partial denture inserted the same day a patient has their natural teeth extracted. A lot of patients at our Calgary Denture Clinic have requested that we post a guide that outlines how they should be taking care of their immediate dentures. Starting from the day you remove your denture for the first time, rinse it out after every meal or snack, and then place it back in your mouth. For the first 5 days, keep your denture in at all times except to clean. Avoid mouthwashes the first 5 days unless prescribed by your dentist; some mouthwashes may slow the healing process. You can use salt-water rinses as described above during this time. To clean the denture, partially fill the sink with water to cushion the impact if the denture is dropped. A liquid dishwashing detergent is used with a denture brush to clean inside and outside of the denture. Toothpastes made for natural teeth are too abrasive for the denture materials and should be avoided. However, after healing has occurred, a soft toothbrush with toothpaste is helpful cleaning the gums where the denture rests. Your tongue should be cleansed as well as it harbors many of the germs that cause bad breath. After the first 5 days, it is best to leave the denture out at night and let it soak in a denture cleanser. This allows the gums to relax, the tongue to clean the palate and maintain optimal health. Under certain circumstances it may be necessary to keep your denture in all night. If you have any concerns with the healing process, make sure to contact your Denturist. Your Denture Clinic should also discuss additional ways to keep your oral tissues healthy based on your individual situation. For more information, please contact us at inhomedentures.ca or 403.975.1618.